Our Group Fitness Classes deliver a complete approach to fitness that is accessible to all skill and experience levels. We offer a variety of classes with something for everyone -- from the advanced, competitive athlete to the beginner. Our educated, knowledgeable instructors are dedicated to movement quality and are trained to make the workout more or less challenging based on ability, mobility and fitness level. 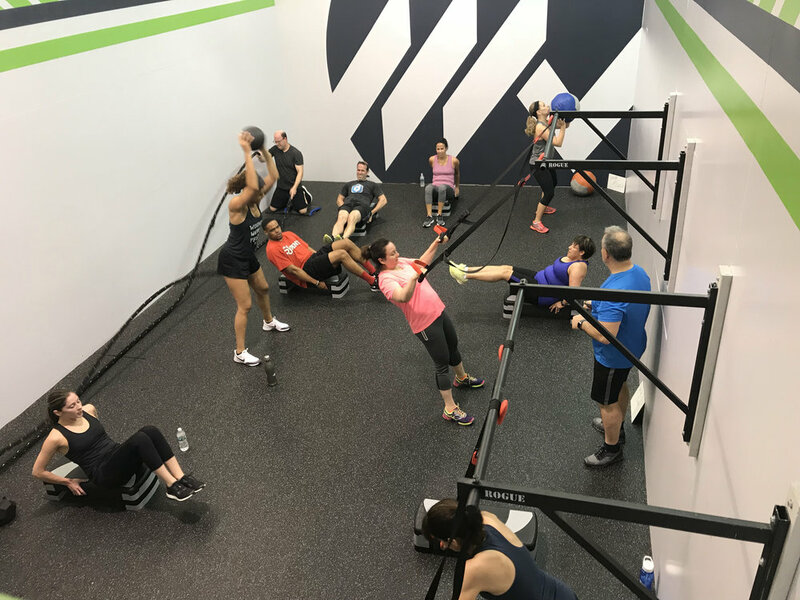 Our 40-minute Core and Conditioning Class is a hit with busy professionals and people on the go. It's the perfect mix of fat-blasting bodyweight exercises, medicine balls, dumbbells, kettlebells, TRX, agility drills and REAL core exercises that will tone your midsection and build a strong foundation. With constant, quality movement, a variety of exercise stations and a few wild cards and surprises, our 60-Minute Circuit Training Class will build muscle definition and fire up your fat-burning engine. Every workout is supervised by an educated, knowledgeable trainer to ensure a fun, safe and challenging workout experience. No fitness program would be complete without a well-designed strength & conditioning program. Resistance training improves overall health and body composition, especially when the program is designed and coached by a certified trainer at the only NASM-approved facility in town. A unique class combining two of the most effective tools for fat loss and cardiovascular conditioning into one workout. Push and challenge yourself, while knowing that a highly certified instructor is watching every rep so you stay safe and get the best results. An empowering workout focused on self-defense skills such as punching, kicking and sprawling in a fun, fat-burning workout that will leave you dripping with sweat and wanting more. Learn how to train like a real MMA fighter -- while being trained by a certified MMA Conditioning Specialist.